Today’s guest post is written by Sara LeeAnn Pryde. Sara with her late Mother. “Speaking of dead moms…” As if one can delicately work that into polite conversation. Which is why today is so impossible. Every year on January 29th – what would have been my mother’s birthday – my sisters and I wake up to our lives and feel numb. Angry. Empty. Anguished. And inconvenienced at having to pretend it’s just another day. And yet, it is. That’s the added insult to the injury of death, isn’t it? That the world should continue on when we can’t possibly? For weeks leading up to our mother’s would-be-birthday, we dream of her. A dim, golden-haired waif whose face we can either recall with perfect clarity or never quite make out; so, we wake up on the 29th bloody tired, sometimes wishing we hadn’t, wishing we could stay beside her awhile longer. I brew a pot of coffee, thick as mud, and trip over my accursed cats. How can they think of food today? Some 1200 miles away in California, my sister Brynn begrudgingly slaps the snooze button and buries her head. Not far south in a neighboring city, our sister Chelsie lifts her chunky, blue-eyed infant from the crib and feels her own burn with unshed tears. Ocean eyes, like our mother’s. The clock is running and daily life proceeds as usual, but we three are frozen in time. We are thinking of our mom. We may want to talk about her, to say her name aloud… but our significant others have never met her, don’t remember what today is, or at least not what it means to us. We may want to hide from it altogether, and are grateful our friends and co-workers are as clueless as the bank teller or grocery clerk. 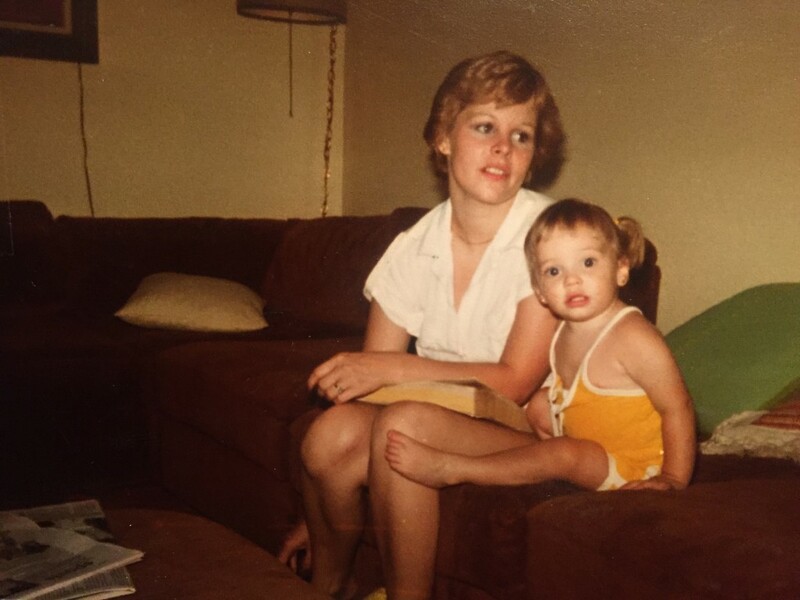 I sit down to write a tribute to my mother that will do my sisters proud, but I can’t find the words. How can I tell who she was to me? How can I tell why my own identity have splintered in her absence? How can I tell that losing her was more than just a tragic accident? How, especially when we haven’t reconciled that it was an accident at all? How can I breathe to life what is, some days, such a damn, diaphanous mystery? Cindy was… Our mom was… magic. All smoke and mirrors and sparkle and magic. And one day she just disappeared for real. I gave up my memoir and went out instead to buy a bulk-sized bag of Jelly Belly Jelly Beans. They were mom’s favorites – especially the black licorice flavored. She and I would always fight over the licorice ones. The grocery clerk didn’t ask about my dead mom. He asked me about snowfall and if I’d had a pleasant new years’. I resisted the urge to punch him and cried in the car. Back at home, I rummaged through my kitchen cabinets and art supplies and crafted a ridiculously cheerful Jelly Belly centerpiece on the dining table. Then I ate every single black jelly bean in memory of her. Sometimes speaking of death isn’t necessary, and sometimes sharing it isn’t possible. We do as we do to get through. We eat the black jelly beans. About the author: Sara LeeAnn Pryde is an enigma wrapped in a question mark behind a coat of winged eyeliner. She’s moonlighted as a massage therapist, optometric assistant, erotica photographer, small business owner and social media manager, but if you ask what she does for a living, she’ll laugh and ask you if that’s the most interesting question you can come up with. 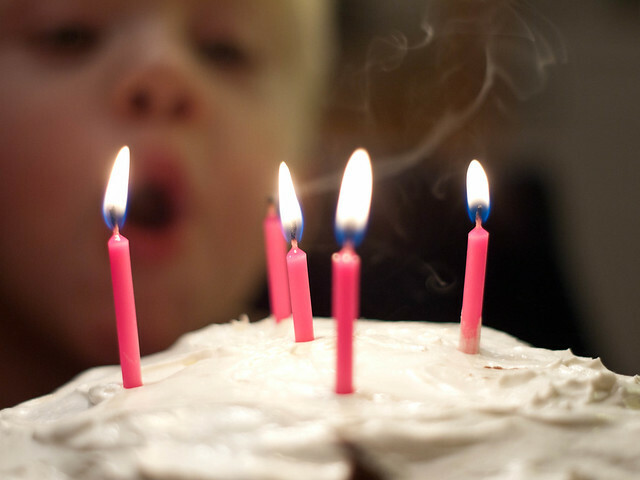 Most children wish for a pony, or maybe a trip to Disney World when they blow out their birthday candles. For as long as I can remember, on my birthday I would wish for a cure. A cure that would keep my father around for my birthday the next year. My father had cancer my entire life. I spent so many years simply hoping and wishing that one day I would wake up, and my father would be cured. No more doctors’ appointments, no more chemotherapy, no more cancer. That was my wish every single day, but that wish was especially important when I blew out my birthday candles. For some reason it seemed more logical in my innocent mind that if a cure were to happen, it would be more probable on my birthday. I never told anyone of my wish, because everyone knows that as soon as you tell people what you wished for, it never comes true. This year will be different. This year I will not wish for a cure. This year, I will blow my 21 candles out, and I will wish for something completely different. I will wish that heaven is just as magical as it is in my dreams. I will wish that my father’s pain is long gone, and that he gets to sleep on clouds and eat as many marshmallows as he pleases. That has always been my child-like idea of what heaven is like. Most people who are diagnosed with cancer spend at least a little bit of their time feeling sad, or hopeless. I was blessed to spend my entire life watching my father handle his diagnoses with grace. I never once heard him complain, and never once saw his fight to live flicker. We spent our 20 years together building memories that I will treasure forever. In August of 2014 the doctors told my father that there was not much else that they could do in order to treat his cancer. They encouraged the idea that he spend his last few months making end-of-life decisions. That doctor’s appointment was on a Tuesday. My father passed away the very next Sunday. I can remember sitting on the bench in the waiting room of the doctor’s office. My father had just received the news. He sat next to me while I cried, and promised me that we would all be okay. He could not have been more right about that. The doctor had specifically stated that my father had MONTHS not WEEKS left to live. There was a conversation that I wanted to have with my father, but I struggled with when to bring it up. I did not want my father to think that I had given up hope. The day after the appointment we were sitting in the living room together. I looked at him and bluntly said, “Daddy, are you scared?” My father looked up at me and without hesitation said, “I am not scared of death. I am scared to leave you guys.” That was my father, always taking care of his girls, even until the very end. My next statement was the one I had been thinking about for months. I had read the articles, and heard the stories, about when people send signs to their loved ones from the other side. I could feel the tears welling up behind my eyes, and I embraced them and told my father that when he got to heaven, I needed him to send me a sign to let me know that he was okay. Together we decided on the cardinal. When I was a little girl my father would wait for the school bus with me. Every few days a cardinal would show up in the tree outside our front door. Every time my father saw it he would get insanely excited and holler at me to notice its beautiful red feathers. For some reason that memory always stuck out in my mind. Even as a grouchy teenager, my father would point out the cardinal and I would smile. My father agreed that when he got to heaven he would send me a cardinal if the opportunity arose. I never told anyone about the conversation that we had. In the same sense as a birthday wish, I needed to keep our agreement a secret in order for it to come true. Not even a week later, my father was gone. He passed away peacefully in his sleep. If there is anyone in the world that did not deserve to suffer, it was my father. My mother, sister, and I made the funeral arrangements together. Those few days remain a whirlwind in my mind. The world lost a great man, and I lost the best dad the world had to offer. The day of the funeral was as perfect as it could have been, considering the circumstances. The weather was uncharacteristically cool for the month of August. We showed up to the church and greeted our friends and family. The minor details remain a blur in memory. I had so many emotions raging through me, I was not quite sure how to feel. My mother, my sister, and I walked into the chapel as our friends and family stood around us. We were a team. We were minus one of our players, but a team nonetheless. We were his girls. We walked to our seats, and embraced the tears that were inevitable. As I took my seat, I noticed all of the beautiful flowers that people had sent in honor of my father’s life. Out of probably 20 arrangements, the one that was placed directly in front my seat held a small, decorative cardinal. I was at a loss for words. On this incredibly important day, my father took the opportunity to tell me that he was okay, and that he was with me. I tearfully accepted his message, and I let a smile creep across my face for the first time in what felt like forever. I feel my father all around me, I do not need to see a cardinal to know that he is with me always. In that moment when I step outside, and the wind sweeps my hair off of my neck, my father is there. When I am walking to my car, and I take a moment to look at the stars, my father is there. And this year when I blow out my 21 candles, my father will be there. My innocent, child-like birthday wish finally came true. My father will be at every one of my birthdays for the rest of my life. This year I do not have to wish for a miracle, because I was already given one. ABOUT THE AUTHOR: Heidi Evans is a senior living in Oklahoma City, pursuing her bachelors degree in Funeral Service. She works in the Funeral Service industry and plans to be a part of the changes making their way through the death care industry in the coming years. 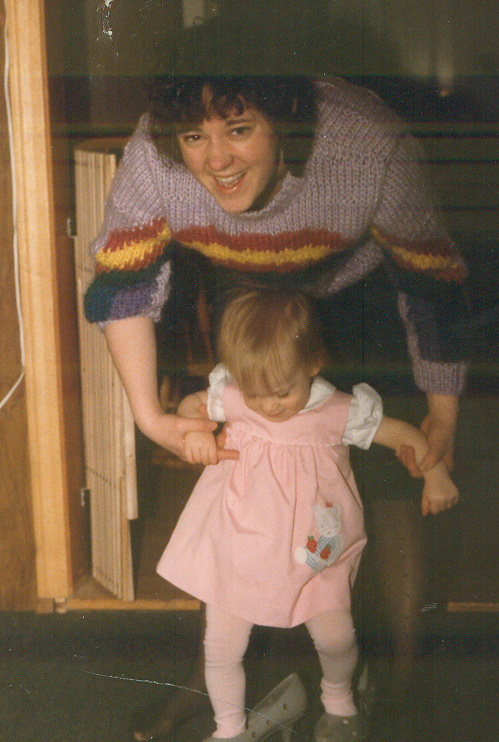 Bridget at two years old with her mom. I will never forget that day as long as I live. I can remember how the air smelled as I walked into my childhood home for the last time believing my mom was alive, I know exactly what I was wearing, what I did with my children that morning. That is probably the most defining moment in most of my family’s’ lives. For years leading up to that day, my immediate family had been a mash of turmoil. The woman who had been our pillar for my whole life came out of brain surgery for a bleed in her right frontal lobe in 2002 as an entirely different person. Gone was my loving and doting mother, the kind and sensitive spirited woman who my father had married in 1980, the R.N. with a Master’s Degree who opened a brand new hospital as nursing manager. This accomplished woman slowly through ten years’ time became a shell of who she was and eventually morphed into a new person. That is not to say we did not try. We tried like HELL! My father spent tens of thousands of dollars on rehabs: rehabs for alcohol abuse combined with brain injury, rehabs just for alcohol abuse, rehabs just for brain injury, and rehabs for mental illness. They all worked… for a little while. However, we as people do not have the tools to combat someone who is so smart they can talk their way out of psych wards due to heightened medical knowledge. Someone who commits suicide does not see a way out. The best analogy I have heard regarding this is similar to describing someone in a skyscraper trapped in a burning building that jumps. I believe my mom saw no way out and she “jumped.” She knew things were not getting any better. Her behavior was all encompassing of my life, my father, my husband, her sisters…. I believe in my heart she thought there was no way out for her. I don’t know ,even today, if there was. I wish she were here so we could have tried. Her last two weeks on Earth, she had just “cycled” into a good period. My sister and I plus my husband and kids spent a fabulous mother’s day with her at brunch. I am so grateful for that day and those memories. I consciously told myself to take pictures that day, I knew the end was coming…but I couldn’t bring myself to do so, I really did not want to believe she would not beat her demons. I wanted to take pictures in July at my son’s first birthday, and Halloween and Christmas…. So May 22, no one could reach my mom after 9pm. We now believe she committed suicide sometime in the night. It was cold and dark. She hated both things. The amount of self-hatred she had still overwhelms me. I took my children to the doctor the next morning. I went to lunch and had a good time with my girlfriend and her kids. On the way home, I knew someone needed to check her. I called my dad who I picked up (he had moved out by this point), he jumped in my car and I told him to just drop me and as soon as I found her, he could come back. The house was locked up tight. I had to get in through the basement garage. Inside, silence awaited me. I knew something was very wrong. I checked her bed which was empty. The living room had her diet coke on the coffee table with the TV on. The dogs were out of food and water, which on her worst day was unlike her. I went out to the back deck and found her…floating upside in my childhood family pool. After screaming and calling 911, everything becomes a blur. The operator tried to coax me to get her out of the pool, I knew there was nothing I could do at that point. No one who is living even a little bit floats like that. That is one image I will never, ever un-see. Obviously, anyone in the funeral profession knows that state police came and investigated and the medical examiner was called in. Her official autopsy report ruled her death as suicide by drowning. We went through the motions and planned a funeral. I suppose I must have been there, I don’t really remember much. I read her eulogy. We had a gathering after with an Irish band playing. She would have loved it. Through my whole life while my mom was living, I struggled to find my place in life. I went from degree to degree changing from nursing to teaching secondary education and finally to accounting, which is the field where I worked when she died. My mom was cremated, we did not bury her for six months after her death. 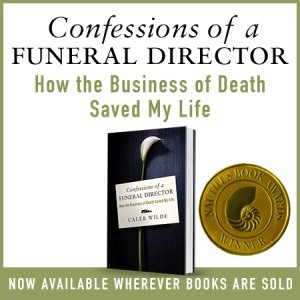 At her cremains burial, I was chatting with the funeral director who was looking for someone to help balance his checkbook. I offered to help. That was two and half years ago. I’ll be done my degree in mortuary science in May and sit for my board in June. I like to look at the change in careers as my mother’s final gift. I know that I can help families during their times of heartache and sorrow because I can literally relate. I know the importance of having someone guide you and be supportive. Since my mom’s death, our family has also banned together to create a non-profit organization “Brake the Silence” which is aimed to break the stigma of mental illness and prevent suicide. 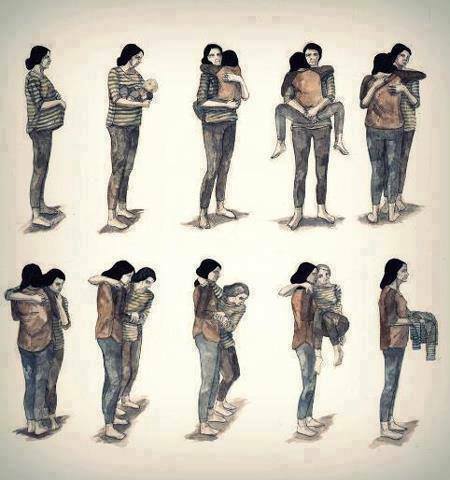 I will not let my mother‘s death be in vain. In life, she helped others. She will help others in death. Through her story, awareness is brought out. It is easy to ignore mental illness; it is not as in your face as many other illnesses. Addiction is also easily ignored. But when you hear of the staggering numbers of suicides as direct results of both of these, you have to stop and think. Are we doing enough? My mom’s legacy lives on through her girls and her grandsons. I don’t harbor any anger towards her. I just miss her. About the author: I, Bridget, am 31, married, with four little boys (10, 8, 5, & 3). I’ve lived in Central MA my whole life. I have a Bachelors Degree in history. I really thought I was going to teach high school. I am currently employed at a funeral home. I’ve been here for a little over two years. I am also in school through distance learning at the Commonwealth Institute of Funeral Service in Houston, Texas and I will be done in May! YAY! I love my job so far and I cannot wait to be fully licensed in June.